• Córdoba Norte (Chacarera) - Atahualpa Yupanqui. • De Simoca. (Zamba) - Chango Nieto. • Aquellos tangos camperos (Tango) - Horacio Salgán. • Boedo. (Tango) - Horacio Salgán. • Preludio en vidala (aire de vidala) - Matías Martino. • Carora (Venezuelan waltz) - Antonio Lauro. • La muerte del angel. (Tango) - Astor Piazzolla. • Natalia (Venezuelan waltz) - Antonio Lauro. • Guajira a mi madre (Guajira Son) - Ñico Rojas. • Milonga de mis amores (Milonga) - Pedro Laurenz. • Shortcut. (Choro) - César Camargo Mariano. • Cristal (Samba-Choro) - César Camargo Mariano. • Tico Tico. (Choro) - Zequinha de Abreu . • Our Spanish love song - Charlie Haden. • Capullito de alheli (Son) - Rafael Hernandez. • La Cumparsita (Tango) - Gerardo Matos Rodríguez. • Danzarin. (Tango) - Julian Plaza. • BIS Libertango. (Tango) - Astor Piazzolla. Arian Houshmand was born in 1983, he began to play the guitar at age 10, primarily self-taught and building upon a wide array of musical influences. At age 14 he studied guitar and harmony with the Cuban guitarist Ciro Sosa for 4 years. At age 16 he competed in the regional Young Musicians of the Gulf competition in Bahrain winning the 3rd prize. After graduating from Emirates International School with the Outstanding Musician Award he was awarded a scholarship to study guitar performance at the State University of New York. 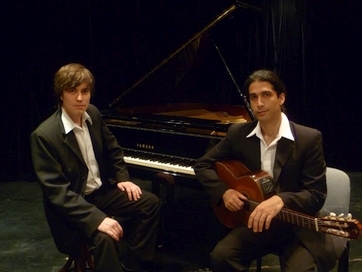 In 2004 he moved to Argentina to further his knowledge and studies in Latin American music completing a course in musical composition and harmony given by the pianist of Astor Piazzolla, “Juan Carlos Cirigliano.” During this time he also undertook a degree in folkloric music and jazz guitar at the National Music Conservatory of Avellaneda in Buenos Aires. Additionally he learned to play several regional instruments such as the Tres (Cuban chordophone), Charango (Andean chordophone) and Cuatro (Venezuelan chordophone). During the past years he has gained experience as a session musician collaborating with many different ensembles, from Flamenco to Jazz, Salsa, Bossa Nova and Tango. He has also directed and written arrangements for his own quintet of Cuban and Latin jazz influenced music and worked as a teacher of music in private and public institutions and schools in Argentina. As of January 2011 he has been working in events and hotels as a freelance musician in Dubai and together with his colleague Matias Martino they are performing 3 times a week at the Vus bar and restaurant at Emirates Towers hotel until June 2011. During this time they will also be conducting a series of seminars and concerts on Latin American music through Art Sawa in Dubai and NYU in Abu Dhabi. Matias Martino was born in 1985 he began playing the piano at age 10 graduating in 2003 from the music conservatory “Arturo Beruti” in Córdoba, Argentina. During his time at the conservatory he participated in several interprovincial music competitions organized by the Ministry of Education obtaining distinctions of merit in 1996, 2001 and 2003. In 2007 he formed the Martino-Arce Duo (guitar and piano) with whom he won the first prize at the National Folklore Festival. They recorded together and went on to perform regularly at the distinguished tango cafe “36 Billares” as part of a series of concerts sponsored by the Ministry of Culture. Since 2006 he has formed part of a young group of distinguished pianists called CIMAP (Creators and interprets of Argentinean music) directed by Hilda Herrera with whom he has realized monthly concerts. In 2009 he completed the 4 year course in musical composition and harmony given by the renowned pianist of Astor Piazzolla “Juan Carlos Cirigliano”. Since then he has also been working as a music teacher at the Bernasconi Institute (primary and high school level). Currently he is the official pianist of the 10th generation of the “Emilio Balcarce Tango Orquestra”, directed by the internationally acclaimed bandoneon virtuoso Nestor Marconi and with whom he has performed on a regular basis at major concert halls and venues in Buenos Aires and other cities of Argentina. He is also working regularly as a session musician with Latin, Tango and Folklore ensembles. In January and February of 2010 he was invited on a tour to perform a series of solo piano concerts of Argentinean music and his own compositions in France (Paris, Bordeaux) and Switzerland (Neuchâtel).